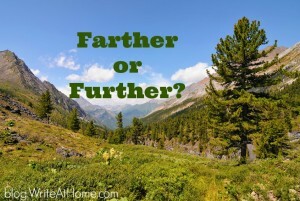 Home / Blog / Further or Farther? When I was budding young grammar Nazi, the distinction between the modifiers further and farther was a particular peeve of mine. I cannot tell you where I first learned that farther was to be reserved for literal distances (e.g., I can’t walk any farther) and further for figurative distance or depth (e.g., Let’s discuss this further over a couple cappuccinos), but I considered it a hard and fast rule. Confusing the two was proof positive that the speaker was a nincompoop worthy of scorn. I have come home at last! This is my real country! I belong here. This is the land I have been looking for all my life, though I never knew it till now…Come further up, come further in! This left me with only two reasonable options: Either Lewis wasn’t smart enough to know the difference between further and farther, or my understanding of the distinction was in need of revision. I wisely went with the latter. Simply, Americans make more of the distinction than the British. A number of U.S. style guides and grammar experts insist upon, or at least recommend, using farther only when talking about actual, physical distance. Further works in all other contexts. In the U.K., I understand, this usage is most common, but less strictly enforced. The words are considered synonymous and interchangeable. These words can be used as adverbs or adjectives, but the distinction between them, if you insist upon it, applies in either case. Adverb: I cannot endure this Justin Bieber song any further. Adverb: I could toss Justin Bieber farther than you. Adjective: For your further enjoyment, here’s a song that’s not by Justin Bieber. Adjective: Justin Bieber is performing in the arena on the farther end of town. Both words derive from the same root and both have a long history with virtually identical usage. Further is far more common on both sides of the Atlantic, most likely because it can be used as a verb as well (e.g., Let’s not further this disagreement), and because the figurative meaning is more commonly used than the literal in everyday communication. To get to the point, I suggest that Americans stick to the distinction and reserve farther for referring to literal distance only. This will help you avoid long, boring arguments with grammar Nazis. Just don’t make a fuss when you see the words used interchangeably — especially in works by British writers. If you are interested in further discussion of this topic, leave a comment below! The word “farther” is not used in the UK. Hearing or seeing the word used by Americans is weird and extremely awkward, from a British perspective. Great post, Brian. I’ve often wondered why the word “further” bothered me just a little when it referred to physical distances, but I didn’t know the reason. Now I know, so thanks. Will Egan, you cracked me up! Another example of how you can’t throw a stone on the Internet without hitting something that mentions Justin Bieber. I wouldn’t mind throwing a stone and hitting Justin Bieber himself.